The New York State Department of Environmental Conservation (DEC) today announced that the public parking and use of Stillwater Reservoir at the end of the Stillwater Road will be much improved for the coming summer recreation season. The Reservoir is located in the Adirondack Forest Preserve, Town of Webb, Herkimer County. Related issues have been resolved through the use of Temporary Revocable Permits (TRP) allowing for limited private use of state land at the Stillwater public dock and Grassy Point. In September 2009, the Department sent letters directing those who had left their boats and trailers unattended in state parking lots in Stillwater to remove them. In the spring 2010, DEC posted signs stating that parking is limited to people who are present at that time on the reservoir or surrounding land and that parking for more than four days without a valid camping permit is prohibited. 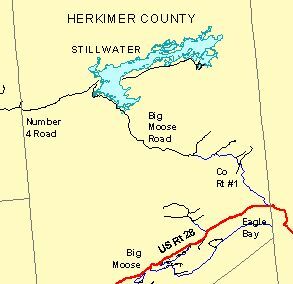 Beaver River is a hamlet of 125 seasonal residents, a handful of permanent residents, and two businesses east of Stillwater reservoir which is surrounded by Forest Preserve and no road access. Despite concerns that the parking enforcement would inconvenience Beaver River residents who want to leave their boats in Stillwater they have been able to find alternatives parking arrangements. The local DEC Forest Ranger has received a number of compliments from the public because of the increased availability of parking. The Thompsons increasing commercial use of the public launch site over the past few years resulted in severe restriction of the public’s access to Stillwater Reservoir. That use included: a barge for hauling people for short day trips to their facility at Grassy Point and for longer term visits and for hauling supplies to the residents of Grassy Point. This issue was resolved by the issuance of a TRP to the Thompsons limiting the time and location of docking their boats, while allowing them to transport people and goods as needed. The state owns Grassy Point and the surrounding land on Stillwater Reservoir near the hamlet of Beaver River. Despite the belief by landowners in Beaver River that the docks they keep at Grassy Point are “public,” these docks were private structures on Forest Preserve and are not allowed. The issue was resolved by discussions between DEC, the Town of Webb and the Beaver River Property Owners Association. The Department issued a TRP to the town allowing them to have docks at the end of a town road that leads from Grassy Point to Beaver River. The town, in turn, entered into a license agreement allowing the Beaver River Property Owners Association to maintain the docks on the road right of way. Stillwater Reservoir is spread over 6,700 acres and offers a multitude of recreational possibilities. The primary draw to the public is the undeveloped, remote camping on both islands and along the shoreline but also includes remote wilderness camping, canoeing, boating, fishing, hunting, snowmobiling, and cross-country skiing. The area receives considerable use during each of the four seasons. Camping within 150 feet of the high-water mark is limited to 46 sites designated and marked by the Department. Surrounding the Reservoir, there are two major classifications: the Five Ponds Wilderness Area on the north and the Independence River Wild Forest on the southern shores. During recent years, popularity of the Stillwater Reservoir has greatly increased. In an effort to alleviate some of the problems and preserve remote camping opportunities, campers are now required to use only designated sites along the shoreline or to camp at least 150 feet inland from the high-water mark. More information including a map outlining these specific areas is available on the DEC website.